"Yesterday I went to Walmart and we bought shoes and it was fun and I saw my friend and we played and she came to my house and we drew a picture and I did my math homework." Do you get those, too? It's about that time of year when my students are comfortable enough speaking that they will speak at length (yay!) on a subject, but, sometimes they will go on and on and on. So, I find it necessary to teach sequencing at all levels, in various ways. 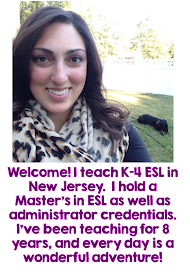 We do a lot of BME's in my class, for speaking, reading, and writing practice, so they are pretty good at the comprehension portion. However, they often lack transition words in writing and speaking, as evidenced above. Here's how I teach sequencing in both domains. I used this website: http://www.turtlediary.com/kindergarten-games/esl-efl-games/picture-sequencing.html It has all sorts of pictures that students can sequence, and mostly in practical applications. It does have an option for nursery rhymes, which I used with my 8th graders. My 2nd graders loved it! They were cheering each other on and helping each other through some of the tough pictures. One of my cuties got stuck on a picture where the man is putting on his seatbelt, and they all prodded him with the word and with gestures until he got it. I used this on my whiteboard, and I'm not sure if there is an app for this, but this would be great as a center activity or something to do in small groups. 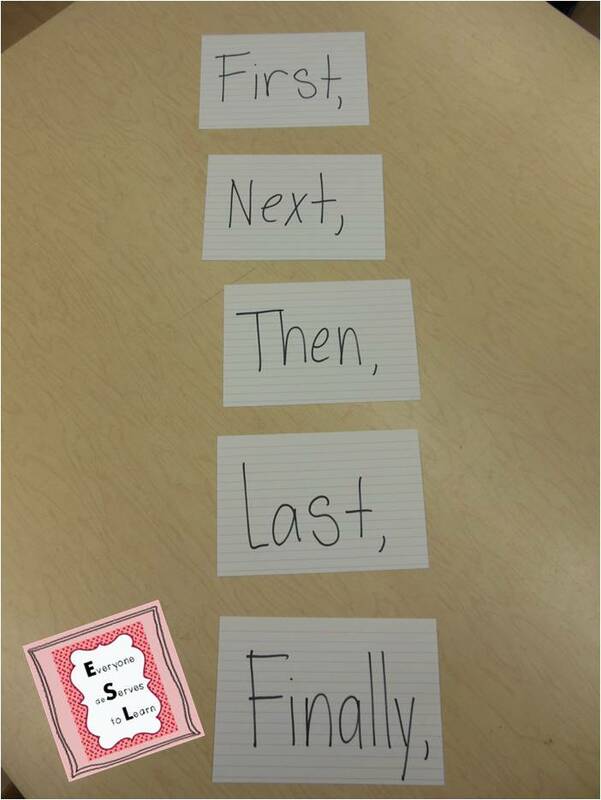 I had my students take turns sequencing the pictures, then, before they put the last marker in place, they had to create a story and tell it out loud using these simple index cards. My students did really well with this, but they also told very simple stories. In a future lesson, I would have them create a story, then go back and add detail into their spoken sentences by having other students ask 5W's questions. It was great to have the tangible index cards, because the kids flipped through them, and flipped back if they missed one or lost their place. They acted like mini sentence frames, and really helped some of my struggling speakers. The next day, we played the same game for a few minutes to warm up, but instead of telling our stories out loud, we practiced writing them. This takes some of my 2nd graders approximately 2.4 minutes, and some approximately 2.4 hours, so I let the early finishers go on my tablet and practice more sequencing with the index cards until the rest of us were finished. I created a freebie just for you, which you can grab here. 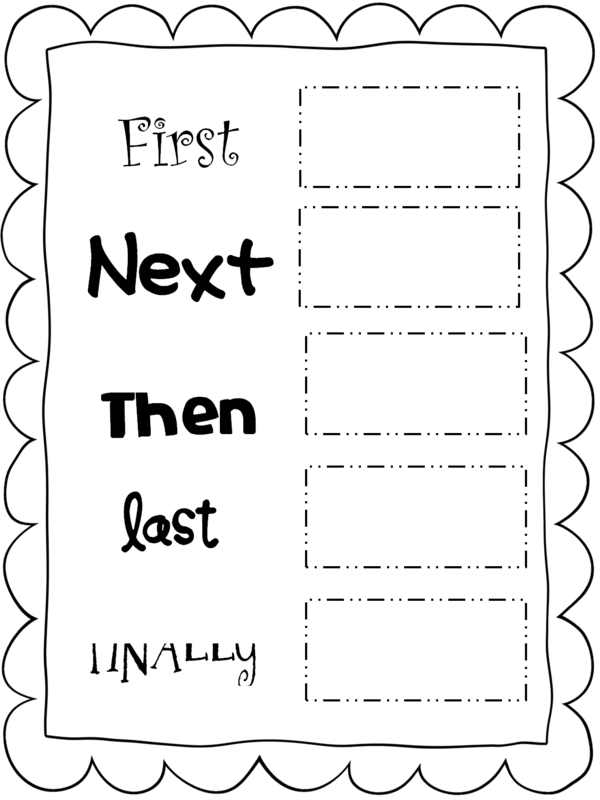 It includes the chart you see, plus a Someone Wanted But So Then chart, which I plan on using with my older students later this week to teach sequencing in reading. 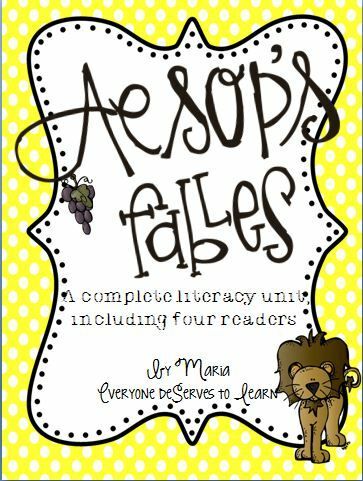 Also, I haven't mentioned them much on here but I have two new products in my store: an Aesop's Fables Complete Literacy Unit, and a Read Across the USA (can't say America!) Reading Project. My students loved Aesop's fables- their favorite was Fox and Grapes. 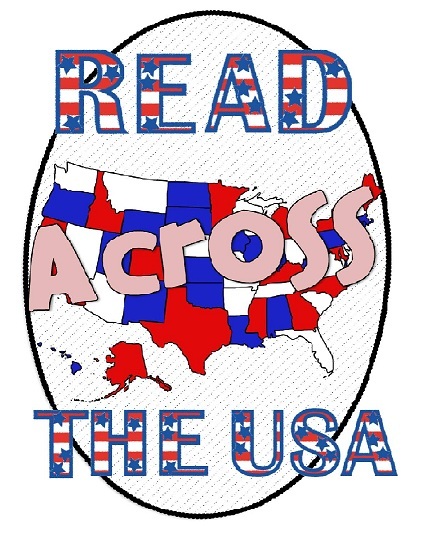 We're starting Read Across the USA next week- I can't wait! I really like the idea of using the notecards as sentence frames. I definitely get my share of those lovely run-on stories. Makes me out of breath just thinking about them! Thanks for the freebie, such an awesome way to reinforce sequence! Thanks for posting the great resource for sequencing skills. I can share it with my pre-K parents as an activity they can do at home with their kids. Sequencing is a skill we have been working on as well. We just read a few Frog and Toad stories. They are great to use for sequencing. Thanks for sharing that sequencing game, I haven't tried that one yet. I have a few kiddos every year that struggle with sequencing and this will be a great tool to add to the box! I love the freebie that goes with it. Thanks for sharing!